Sam Rit Residency is a fee-for-service residency that strives to be an accessible program for all those who are interested. The Program fees for residencies cover basic costs of living as well as the option to choose added facilities and services to enhance their stay. We currently offer three options of stay depending on the services and facilities required - Independent Residency, Semi-Supported Residency and a Fully Supported Residency. Please refer to the table below for details on prices and services. 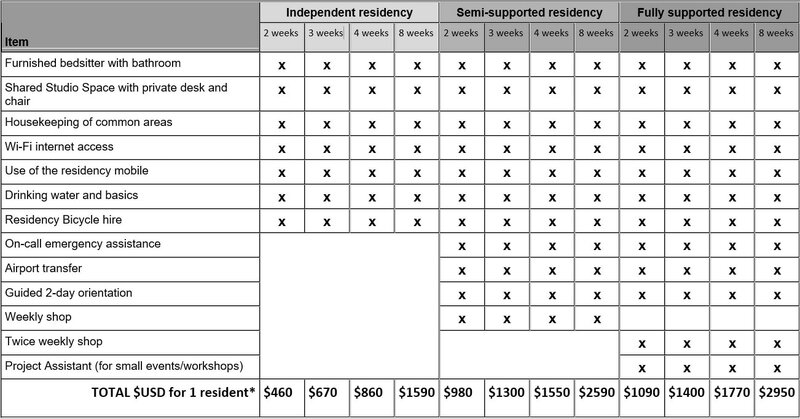 Sam Rit Residency Fee Structure. Please note - these fees do not include airfares or travel insurance. * Please note: prices are listed in $ USD and are subject to change with exchange rates. ** Basics include toilet paper, dish liquid, washing powder, shower soap, mosquito spray and basic cooking sauces. *** The 2 day orientation includes all meals for the first two days, entrance fees to the Phimai Historical Park, a Thai massage, transport and a driver/interpreter. The orientation will cover places of interest and information about Sam Rit Village and the nearest town of Phimai. This is highly recommended for those who are not fluent in Thai or have not traveled to this area before. Residencies with partners, children or collaborators will have the additional costs discounted. We can also be flexible with your duration of stay. Sam Rit Residency is a non-profit entity without government or philanthropic funding. Proceeds from the program are put directly back into the Sam Rit community through employment and projects. Unfortunately we are unable to provide direct financial assistance to residents. We have however reduced the cost of the program to just cover the services we provide and offer a range of packages for residents to choose from. We are also happy to assist residents who are applying for external funding in the form of Letters of Support.